For most folks, Portugal is the home of one of the World’s most famous fortified dessert wines: Port. Baga is a red grape grown primarily in the DOC zone of Bairrada along the Atlantic coast in the larger region of Beiras. The Atlantic Ocean serves to moderate the climate, which is ideal for grape cultivation. Baga tends to produce tannic, complex wines with fairly high acidity, not unlike traditional Barbera from Piedmont in Italy. Casa de Saima, managed by Granca Miranda, maintains the fundamentalist tradition of treading by foot, fermenting in lagares, and aging the wine in 100 year old large casks, before an unfiltered bottling. The result is an approachable wine that has unmistakable, classic character. At an average bottle price of $9.99 per bottle pre-discount this is a significantly undervalued wine. Lush nose with black cherry, tar and floral hints. Medium-to-full-bodied with moderate acidity and firm, dry tannin – good balance. Nice core of dark fruit with plum, tobacco and vanilla notes. 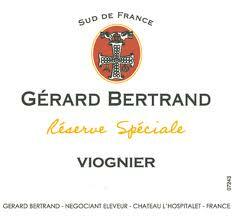 Moderate length – smooth – drinking well now and should improve with another 2 to 3 years in bottle. Great value! Case in point, the aforementioned wine is your garden variety Vin de Pays d’ Oc wine from France, a “country wine” from the most productive regional zone, the “Oc,” which covers most of southern France and is responsible for approximately 85% of VDP production. The VDP classification is a tier in the French Wine Quality hierarchy known as the AOC, or Appellation d’Origine Controlee and is just above Vin de Table and below AOC (technically just under a very rare VDQS tier). The classification was officially recognized in 1973 and has seen subsequent modifications in 1979, 2000 and 2009. The goal of the VDP class is to make it easier for global consumers to be able to understand French wine labels, which in theory increases the probability that your average wine consumer will buy the wine. For winemakers VDP means that the often very strict rules that are a part of the top tier classification of AOC are significantly eased, making it less costly to produce and market the wine. It’s all good, as far as I’m concerned, because most of the time, VDP wines are high-value, quaffable little numbers that have distinctive character with sub-$12 price tags. Remember what I said about the one constant in wine tasting over the last 28 years? Change. Lively, floral nose with tropical fruit and honey hints – very pretty. Light-bodied with moderate acidity – clean – good balance. Soft palate, lightly fruity with papaya, honey and pear notes. Short, clean finish with a refreshing aftertaste. Drinking well now – not for aging. Superb value! Montepulciano d’Abruzzo is an Italian DOC located in the east central part of Italy, sandwiched between the regions of Lazio, Marche and the Adriatic Sea. With more than half of the region considered mountainous terrain, the hillside vineyards in Abruzzo benefit from a warm, sunny climate, which is moderated by cooling breezes from the sea. 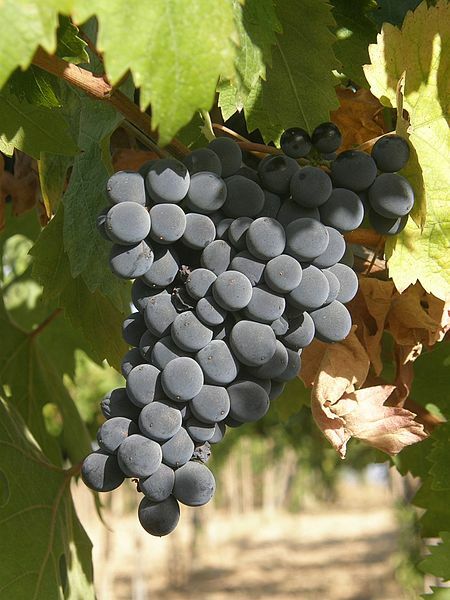 The results are ripe, mature grapes that produce an easy-drinking, food friendly red wine. The wine is made from the Montepulciano grape, with very small quantities of Sangiovese allowed in the blend (less than 15%). The wine is typically dark colored with a spicy, almost peppery note and is generally not meant for aging. Castello di Salle is a well-known quality leader in the region and the Sallis Castrum is their less-expensive bottling. At an average retail price of $13.99 per bottle, the wine is quite a nice value, providing a quaffable potation with some very interesting character. Earthy, rustic nose with anise, black cherry and briarwood hints. Medium-bodied with moderate acidity and moderate tannin – good balance. Dark fruit core with sour cherry, floral and dried herb notes. Smooth, Moderate length with tar and allspice on the aftertaste. Drinking well and should hold for another 2 to 3 years in the bottle. Good value. In the words of Jean Anthelme Brillat-Savarin, the noted and oft-quoted French epicure and gastronome of the late 18th century, “The pleasure of the table belongs to all ages, to all conditions, to all countries, and to all areas; it mingles with all other pleasures, and remains at last to console us for their departure.” Never were truer words spoken, especially as I reminisce about my most recent visit to Gracie’s in Providence (http://graciesprovidence.com). A Boston native who has cooked all over the world, Mallett was named in 2011 as a James Beard semi-finalist for Best Chef Northeast. He is well respected in the culinary industry for his dedication to sustainable farming and is active with and sits on the boards of Chef’s Collaborative, Slow Food Seacoast and the Heirloom Harvest Project – an initiative to join farmers, chefs and educators to identify and restore a food system native to the greater N.H. Seacoast. 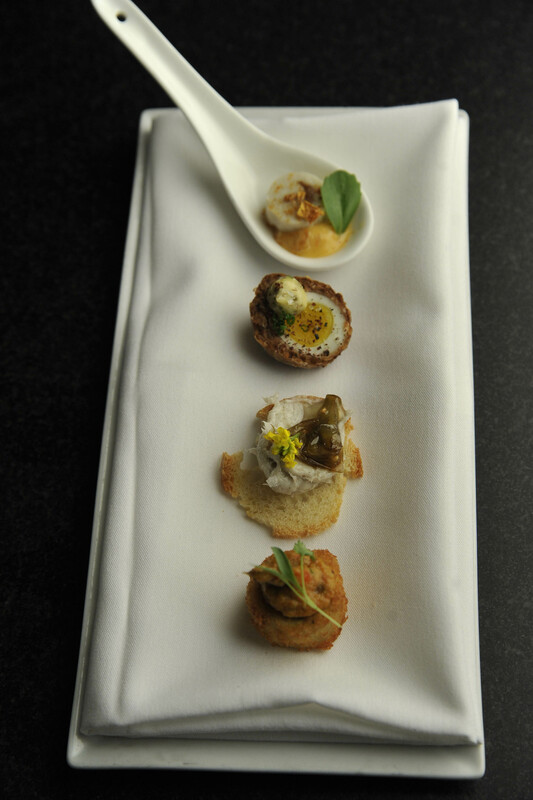 To start the event, a series of passed canapés were served alongside an interesting sparkling Lambrusco Reggiano, the 2010 Medici Ermente Concerto. A delightful paean to traditional Middle Eastern cuisine, featuring Kibbeh made from Archer Beef in Maine, accompanied with an emulsion of capers, cornichons, sumac, thyme, toasted sesame and oregano. A whimsical delight featuring the house made Lardo in a frozen and then spun mousse, whose buttery richness is balanced perfectly by the spicy acidity of house made artichoke mostarda, all perched on sliced baguette. An elegant combination of roes inlaid within a lush emulsified mousse and dusted with dehydrated, deep fried lemon zest. In a word: Wow! Another tribute to Middle Eastern cuisine, this Markeb, or “ferry boat” in Turkish marries a host of ingredients, including roasted peppers, harisa, tomato, ginger, pine nuts, mint, parsley and honey into a lushly complex treat. The meal itself consisted of five courses, each one the unique result of the culinary collaboration between Chefs Mallett and Varga and served with a special wine pairing provided by The Savory Grape Wine Shop. 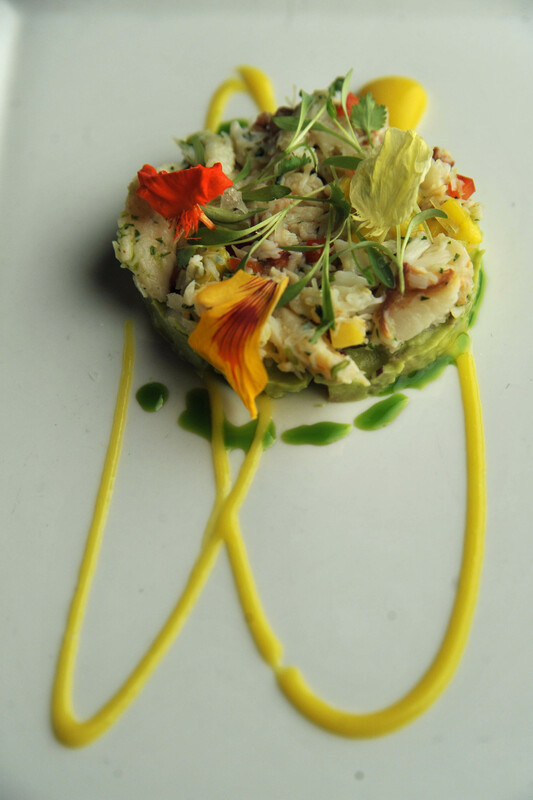 Our epicurean adventure began with Peekytoe Crab served with Champagne Mango and an Avocado-Rhubarb Salsa. The dish was perfectly balanced with the briny, salty flavors of the crab playing gracefully against the sweetness of the mango. The salsa was an interesting blend of buttery, earthy, and spicy flavors that while strong, did not detract from the delicacy of the dish. This was helped by the drizzle of pureed Champagne Mango and rice wine vinegar. The course was accompanied by the 2010 Couly-Dutheil Chinon Blanc, a classically French Loire-based Sauvignon Blanc. With lots of grassy, mineral notes and well-balanced by firm acidity, the wine made a perfect pairing to the dish. Next we were treated to a truly unique soup: New England Baked Bean Soup with Hot Dog Chips and Cheddar Powder and Crème Fraiche. This dish really emphasized local ingredients, starting with the traditional New England heirloom bean, the Jacob’s Cattle bean as the base of the soup. The beans were pureed with molasses, rendered bacon fat, pork stock, mirepoix, garlic and malt vinegar to create a richly complex, earthy “soup.” Garnish this with a sliced, house made hot dog of ground pork and beef, richly seasoned with coriander and paprika; crème fraiche colored by Amarillo; and cheddar powder, made from the poached rinds of farmhouse cheddars and parmesan wheels, and you have one of the most unique courses this reviewer has ever eaten. The course was accompanied by the 2010 Montinore Willamette Valley Pinot Noir from Oregon, a very Burgundian-style, medium-bodied red wine. 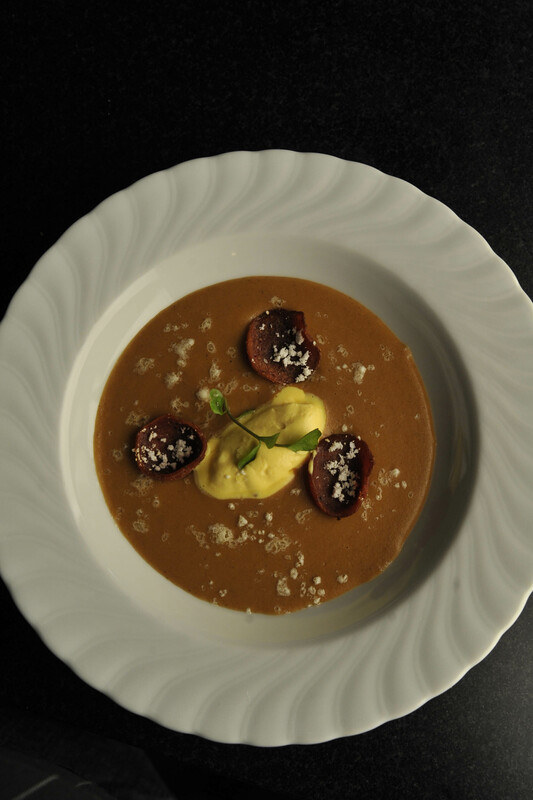 With vibrant, earthy red berry notes and moderate tannins and acidity, the wine paired well with the base soup. However the pairing went south when one added the crème fraiche: too much sweetness blunted the fruit in the wine and brought forward the unbalanced acidity. 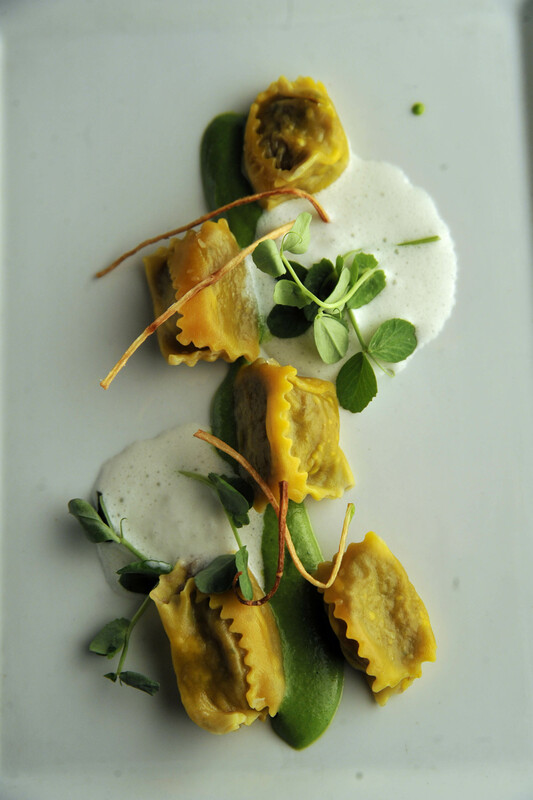 The adventure continued with a Braised Lamb Belly and Yam Agnolotti with a Coconut Chevre and English Pea-Stou. A simple, yet rich preparation using a confit of lamb belly wrapped delicately in a purse of Okinawa sweet potato pasta, producing a cheeky interplay between the ever so fatty and gamey lamb and the natural sweetness of the yam. Marry this with a whipped concoction of coconut milk and locally-made Chevre from Beltane Farms in Lebanon, CT and a brilliantly green pea-stou, which is a Southern French variation of the Italian Pesto and the experience is simply sublime. The course was accompanied by the 2010 Valpane Barbera del Monferrato, a traditionally-styled medium-bodied red from Italy’s Piedmont region. With earthy and peppery red berry notes, the pairing was perhaps the best of the evening, teasing endless complexity from both the wine and food. Worth noting was the bittersweet chocolate aftertaste that resolved on the palate following a bite of the pasta and a sip of the wine. Magnificent! 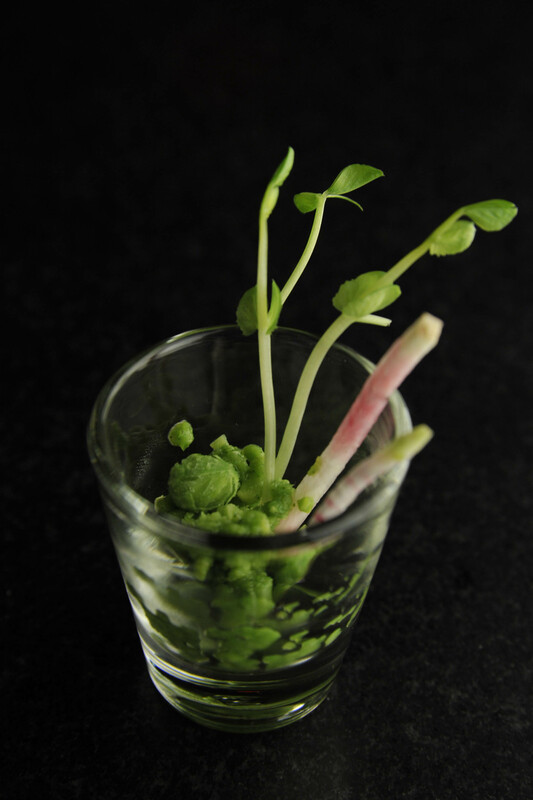 The intermezzo before the main course was simply magical – Poached Peas in Gin Syrup. The preparation was done by freezing and then pureeing the pea ala Sicilian Granita, with an added essence of mint to liven the spoonful. It was the perfect palate cleanser. 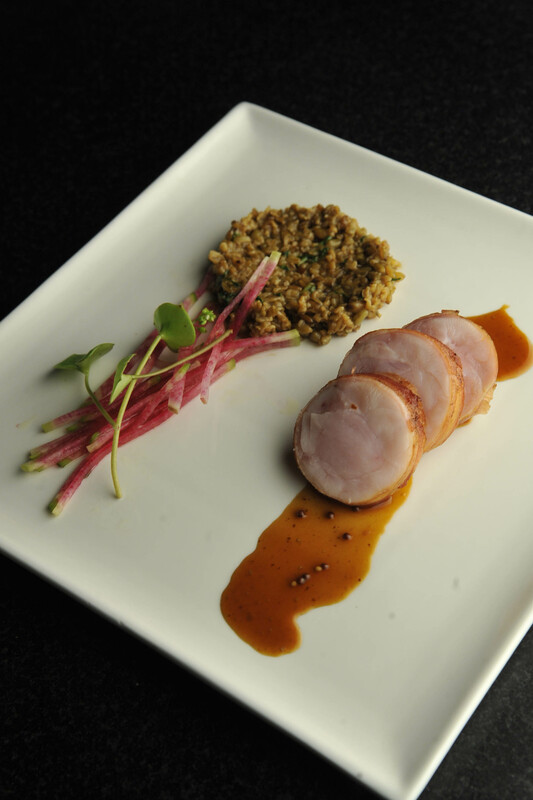 Our main entrée was House Cured Tessa-wrapped Rabbit Tournedoes with Freekeh Risotto, Miner’s Lettuce and Radish Salad. Tessa is considered “lay-flat bacon” cured with fennel, juniper and a host of other savory herbs. Like a Pancetta, the Tessa is shaved and then used to enrobe a combination of the rabbit loin and pounded leg meat. The slow roasting of the meat ensures that the savory elements of the Tessa lovingly marinate the young flesh of the rabbit, which showed incredible depth of flavor. Freekeh, wheat that is harvested and threshed when still green added an earthy element to the creamy Risotto. The course was accompanied by the 2008 Tre Monti Petrigone Sangiovese di Romagna, a classic Tuscan red with earthy, leathery sour cherry notes. With an intense dark core of fruit and cocoa and tar on the finish, the wine paired well with the herbaceous qualities of the rabbit. However, when the rabbit reduction sauce was introduced into the mix, the pairing did not work as well, suffering from the same issue as the soup: too much sweetness blunted the fruit, leaving only sharpness and acidity on the palate. 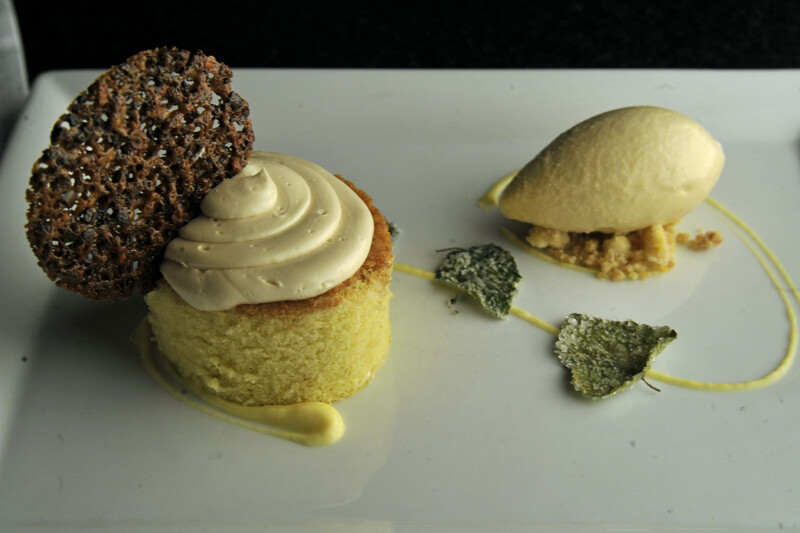 We concluded our meal with a Turkish Coffee Cake with Maple Buttercream, Fernet Gelato and Candied Anise and Hyssop Leaves. The cake was a génoise-style, brushed with coffee, orange and Raki (Turkish Marc), which was delicate and lightly flavored – a perfect ending to such a lush meal. The Gelato was made with the well-known Italian Amaro, or digestif Fernet Branca, but the flavoring was almost undetectable. The sauce was made with crème anglaise, sevilla oranges and African bush tea, which added vibrancy to the finish. The course was accompanied by the 2008 Tre Monti Casa Lola Albana di Romagna Passito, wonderfully honeyed charmer from Italy’s Emilia Romagna region. With hints of orange blossom and quinine, the wine made the perfect pairing with the subtle sweetness and orange elements of the dessert. 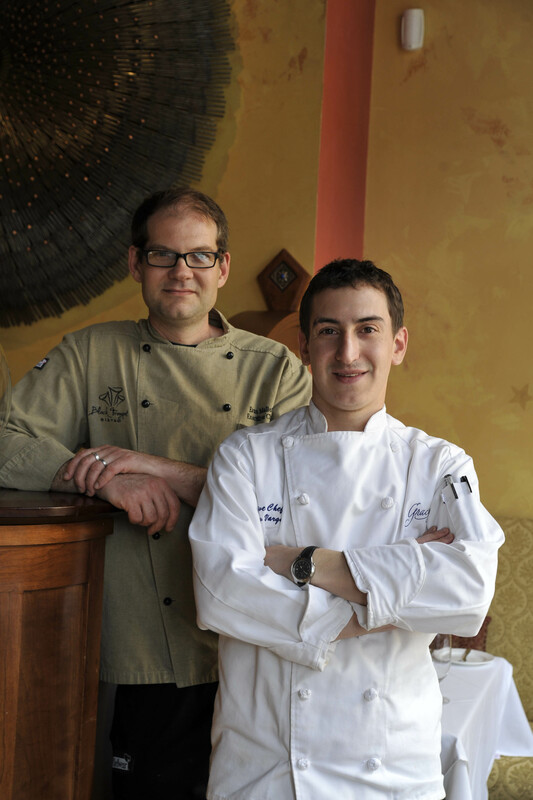 The meal was magnificent and the culinary creativity displayed by Chefs Mallett and Varga was remarkable. The emphasis on local ingredients combined with the subtle influences of Middle Eastern, French and Italian cuisine made for an exotic gastronomic journey. As usual, the service matched the cuisine with smart, professional attention. The Star Chef Dinners are events not to be missed, so make sure you get onto Gracie’s email list to get early notification of the next sumptuous meal!